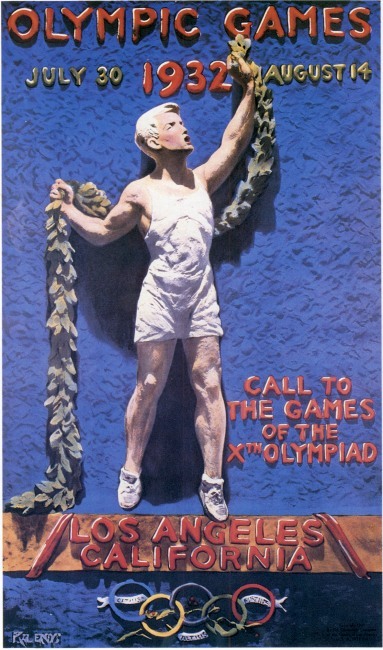 In an effort to produce an official poster which would be novel, and at the same time attractive enough to justify its being displayed over a period of many months, the Committee accepted the design offered by Julio Kilenyi, internationally known medalist and sculptor and designer of the commemorative medal of the Games of the Xth Olympiad. Mr. Kilenyi modelled the design for the official poster in clay, and a photograph of this model was colored and reproduced by lithograph. The poster depicted the ancient Grecian custom of sending a youthful athlete out to announce the forthcoming celebration of the Games. Several thousand copies of the poster were displayed.